What’s with all the seaweed in the Caribbean and Mexico? Seaweed in a natural part of the ocean but this year, it has been exceptionally bad in many parts of the Caribbean and the Mexican Caribbean. There are certain areas of the Riviera Maya that are known to have seaweed and the resorts do a great job cleaning it up every morning and during the day but this year, it is sometimes so dense and so thick, that you can’t get to the beach. So what is this stuff and why is it so bad this year? The stuff is called Sargassum and it’s a vine like floating algae that normally floats around the Gulf of Mexico and the North Atlantic (near Bermuda). This year, it’s showing up along the coasts of Texas, the Cancun/Riviera Maya area and all the way down to Tobago off the coast of Venezuela. Typically Sargassum is good providing food and habitat for a number of sea animals including turtles, fish and even birds. It also helps build and strengthen dunes, so it protects the land and buildings on the shore from storms. With the amount of seaweed showing up now on the white sandy shores of resort areas all over the Caribbean and the Eastern Coast of Mexico, it’s creating havoc. Tourists want the clear blue water and don’t want to have to climb over mounds of brown (and sometimes very pungent) seaweed to get into the ocean. It’s affecting fishermen who can’t fish through the thick seaweed. Satellite data suggest the amount of sargassum in the Gulf of Mexico, Caribbean and Atlantic may hit an all-time high in 2015. Is there anything that can be done about this seaweed? Other than raking it up with heavy equipment (since the resorts had been doing it with hand rakes), there is really nothing that we can do at this time. My Vacation Lady is in contact with clients and colleagues all over the Caribbean who are reporting mass amounts of seaweed one day and virtually nothing the next. Just between beaches, the amount can differ. Unfortunately, it’s an act of nature and other than making our clients aware of the situation this year, and perhaps change destinations to the Pacific Coast of Mexico or Hawaii, there is not much we can do. For those clients who are only interested in the white sand and clear turquoise waters, we may have to talk a bit more about the possibility of this seaweed effecting your vacations and honeymoons but otherwise, bring water shoes? Our goals is to help you plan a seamless and stress free vacation or honeymoon experience and if we could have a chat with Mother Nature to get rid of this Sargassum, we certainly would. 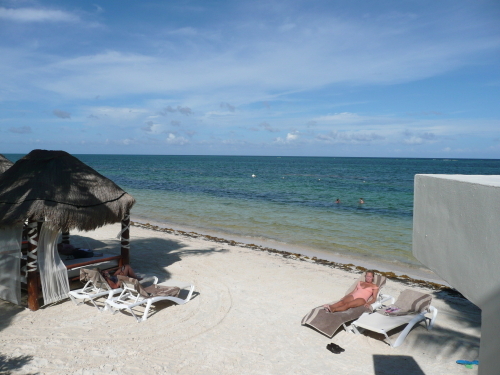 By Mindy Gilbert|July 27th, 2015|Categories: All|Tags: Cancun vacation, Caribbean vacation planning, Riviera Maya Vacation, seaweed in the Caribbean, seaweed on Mexico's beaches|Comments Off on What’s with all the seaweed in the Caribbean and Mexico?